THE TRIBUNAL RESUMED AS FOLLOWS ON TUESDAY, 2ND MARCH 1999, AT 10:30AM. MR. COUGHLAN: May it please you, Sir. At your direction, Sir, I propose to make a further outline statement dealing very briefly with the work the Tribunal proposes to do over these particular sittings. Broadly, sittings will deal with two types of material. .
Firstly, the Tribunal will seek to complete the examination of evidence in connection with a number of matters which were dealt with in the sittings which commenced on the 28th January, but were for a number of reasons evidence that was not available or had to be deferred. Secondly, the Tribunal have examined witnesses and documents which relate to matters already touched on but which were not available at the Tribunal’s last sittings or where the relevance of those documents was not then apparent. Lastly, a number of novel matters arose in the course of the evidence at the Tribunal’s adjourned sittings which require further investigation. These investigations have been instituted and are continuing. However, rather than delay the inquiry, it seems preferable to produce as much of the relevant material as the Tribunal has been able to assemble to date. .
Further material which is in the course of being assembled will be produced during the course of these sittings. This may entail short notice in some cases where this can not be avoided. However, where any person likely to be affected by any such evidence finds himself or herself in difficulties, the Tribunal will consider whether it may be necessary in those cases to adjust its programme of witnesses. . The evidence to be given at these sittings will be dealt with under a number of headings, corresponding to those employed at the last sittings with one exception to which I will refer to in a moment. . Under the heading “Tripleplan,” turning first to Tripleplan, the Tribunal will examine the evidence of two further witnesses in order to complete its inquiry into the circumstances surrounding the payment of sterling £282,500 from Dunnes Stores Bangor to Tripleplan, the sum, the bulk of which ultimately found its way into the account of Mr. Charles Haughey. This is a fact which Mr. Haughey now accepts based on the evidence produced before the Tribunal. Mr. Michael Irwin, who was the financial controller of Dunnes Stores, will give evidence which will deal further with the circumstances so far as is known to Mr. Irwin surrounding the making of this payment and the subsequent treatment of this payment by Dunnes Stores. .
Mr. Hughes, from Oliver Freaney & Company, will give evidence concerning attempts made by Dunnes Stores and Oliver Freaney & Company to establish the identity of the payee of the cheque, in other words, the identity of Tripleplan. .
Mr. Irwin will also deal in part in his evidence with the writing of bearer cheques and also deal with the circumstances in which the Carlisle Dunnes Stores cheque, that is the three cheques drawn on Dunnes Stores Grocery Account in the sum of £180,000, were written. In addition to the matters mentioned above, evidence will be given in relation to the Dunnes Stores Carlisle payments with a view to examine one of the issues of fact addressed in the evidence in the course of the adjourned sittings, that is the state of knowledge of Mr. John Byrne and Mr. Patrick McCann concerning these payments and the time in which they acquired any such knowledge. A number of issues of fact have already been addressed in the evidence of witnesses called in connection with the payments made on the Dunnes Stores Grocery account described as the Dunnes Carlisle payments. In the course of the evidence given at the adjourned sittings, additional information came to hand concerning Celtic Helicopters and the manner in which that company was both funded and controlled in the period under review in this inquiry. Further evidence will now be given in relation to the initial funding of that company in 1985 and the later funding of the company in 1992/1993. As was stated in evidence at the adjourned sittings, nearly £300,000 was paid to the company in 1992/1993 and the treatment of this sum in the books of the company was the subject of evidence given by a number of witnesses at the adjourned sittings. The Tribunal will now call evidence in relation to payments made to Celtic Helicopters in 1985 amounting in all to some £75,000. This sum, which formed part of the initial capital of the company, appears to have been sourced from an account under the control of the late Mr. Des Traynor. Evidence has already been given by Mr. Joseph Malone concerning the sum of £15,000 which he invested in the name of his son in the setting up of the company at the request, as he stated, of Mr. Charles Haughey. It appears from information on documents made available to the Tribunal that the source of the lodgement of £75,000 to the Celtic Helicopters account in Guinness & Mahon at that time was a transfer from another Guinness & Mahon account. That account was current account number 08116008, which was an account in the name of Amiens Securities Limited. This was an account controlled by Mr. Des Traynor. It had been opened on the 17th January 1985 and was closed a short time after on the 17th April 1985. And on the 28th March 1985, a sum of £10,000. There was, it appears, another smaller lodgement on the 26th March 1985 of £1,034.50. From documents made available to the Tribunal by Guinness Mahon, it appears that the source of the £10,000 lodgement on the 26th March 1985 was a cheque in that amount payable to Mr. Michael Dargan and drawn on the account of Mr. Magnier, GS No. 14 with Allied Irish Banks Limited, St. Patrick’s, Bridge Street Branch, Cork. Dr. Michael Dargan has informed the Tribunal it was never his intention to make any such investment in Celtic Helicopters or any payment towards the setting up of that company. He has informed the Tribunal that the sum in question was due to him by Coolmore Stud under the control of Mr. Magnier. There would appear to be no suggestion other than that the cheque was, in fact, drawn in respect of sums legitimately due by Dr. Dargan by Coolmore Stud, but Dr. Dargan has further informed the Tribunal he has no knowledge how the cheques came to be lodged to the account in question and/or as I have already stated, came to be transferred to the account of Celtic Helicopters. And I’d like to stress here that the payment of the cheque from Mr. Magnier of Coolmore Stud to Dr. Dargan appears to be a completely legitimate payment arising out of nomination fees. The payments of £10,000 and £15,000 and £25,000 on the 26th March 1985 and on the 27th March 1985, respectively, were sourced from Ansbacher accounts. . The final lodgement to that account was in the sum of £10,000. This sum was transferred on the 28th March 1985 from a Guinness Mahon account, No. 055-19055. The Tribunal has been informed by Guinness Mahon that this appears to be an account of Mr. Seamus Purcell. It seems that a number of issues of fact would have to be addressed at this stage; namely, as to who, in fact, made these payments/investments; whether these payments resulted in the conferral of a benefit on Mr. Charles Haughey; whether they constituted payments to connected persons; whether they constituted payments to a company with which Mr. Haughey was associated or over which he had control. .
A similar issue would have to be addressed in relation to a payment of £100,000 made by Mr. Michael Murphy in 1992. From evidence already given at the Tribunal, and from information made available to the Tribunal, it will be necessary to establish whether in the first place this was a direct payment to Mr. Haughey. It will be recalled that evidence was given that the sum of £100,000 was lodged to an account in Zurich controlled by Mr. John Furze, namely an Ansbacher account, and that at the same time, a sum approximately equivalent to the sterling equivalent of £100,000 Irish at the then-rate of exchange was debited from an account in Dublin in Irish Intercontinental Bank under the control of Mr. John Furze and credited to the memorandum account known as the S8 account, which was the account in respect of which evidence has already been given, payments were made for the living expenses of Mr. Charles Haughey. 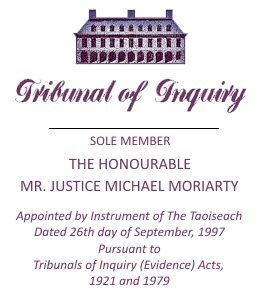 The Tribunal will also need to examine further evidence and further documentation with a view to addressing the issue as to whether, as was suggested by one of the witnesses, Mr. Paul Carty, this investment was held by Mr. Michael Murphy and a French investor on a 50/50 basis; whether it was, in fact, beneficially exclusively for Mr. Michael Murphy as has been stated by Mr. Ciaran Haughey and Mr. John Barnicle. In addition, it will be necessary to consider, in light of the information now made available by Mr. Murphy, whether, in fact, the sum was in the nature of an investment held beneficially to the extent of 100% on behalf of a Mr. David Gresty of DB Agency, a Monaco based company. In any event, however, the investment was made, or by whomsoever it was made, it would be necessary to consider whether it was a benefit to Mr. Charles Haughey or to a connected person or to a company with which Mr. Haughey was associated or a company controlled by him. . Under the heading Allied Irish Banks. Evidence will be given by directors and former directors of the bank and one former executive concerning a settlement of Mr. Haughey’s indebtedness to the bank at £750,000 in 1979/1980 and the publication of the statement concerning his account in 1983. Evidence will be given by the directors of the bank concerning the state of their knowledge of the settlement or of the indebtedness on the account and also concerning a statement of their knowledge of the press release of 1983. The issues of fact which will continue to be addressed in the evidence of these witnesses are whether the settlement amounted to the forbearance by the bank of a very substantial sum, the forbearance amounting to a sum somewhat short of £400,000; whether the operation of the account from 1976 onwards, in a way in which interest on the account was put into suspense, amounted to a grant of an indulgence and, effectively, an indirect payment. The facts will have to be addressed whether the settlement was commercially justifiable in circumstances in which there was a genuine apprehension on the part of the bank that Mr. Haughey had the will and the capacity to inflict damage on the bank’s interest if a settlement was not achieved or his account with the bank was not terminated without resort to litigation or the enforcement of security. Other matters have been investigated by the Tribunal in respect of which evidence may be given as further material being sought by the Tribunal comes to hand. A further indication of the nature of that evidence will be given as and when necessary.